Content marketing, as we all know, is as crucial to a successful modern-day marketer as a telephone is to a sales person. A company may have great marketers and a library of decent content, but without a master plan in place, that content may never see the eyes of who really, truly cares — their buyers. So, where are buyers engaging? How are they being engaged? What keeps them coming back? I could feed you stats all day about this marketing channel, like how 70% of consumers learn about a company through its blog versus ads, and that 82% of consumers actually enjoy reading relevant content from company blogs and read 5-10/day on average¹, but I won’t. I’ll stop there. What I will feed you, is a list of 4 reasons why you NEED to start a blog or maintain/beef up your current one. SEO Super Power: Most companies begin blogging to boost their SEO, and for good reason — “blogging increases inbound links by 97 percent, the most important factor in Google’s ranking algorithm,” according to, Neil Patel of KISSmetrics. 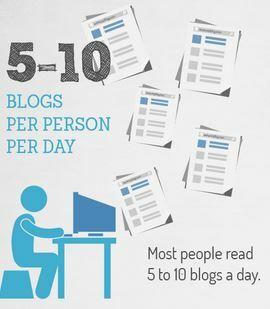 Overall, companies with active blogs see an average increase of 55% in web traffic. Thought Leadership Creates Value & Cultivates Trust: Business success relies heavily (close to “entirely”) upon what buyers think of and how they see a company. Does this company provide value? Are they a source I can trust? These are the questions they need answered, and what better way to help answer them, but with a company blog? Show your buyers you care — about the industry, their needs, and the quality of the products/services you provide. Position your company as a trusted, high value, thought leader, with more than just a pretty website and a fancy name. Additional/Inexpensive Data Acquisition: By now, you know your buyers pretty well (or should), but why not keep up the changes and be sure you’re on top of every nuance they get into? By creating and maintaining a company blog, you will be able to accurately (and inexpensively) track and analyze your buyer’s interests — helping yield insight into what your messaging needs to look like moving forward. Conversion Rate Increase: Do you know what influences your buyers to make the deal? Thirty-one percent of buyers say that the second most influential factor in making a purchase is a company’s blog, and 61% of U.S. consumers say they’ve made a purchase based solely on reading blog content². Converting leads into sales isn’t an easy process — help the process along by providing your buyers with access to a well written and visually stimulating blog. There are over 240 million blogs with 329 million readers engaging with the over 500,000 new entries daily³.Thus, it’s fairly safe to say that blogs are important, and given reasons 1 through 4 above, you might even agree that blogs are essential. DISCLAIMER: Simply creating a blog isn’t enough. Be sure to check back at my tips in 4 Ways To Make Your Blogs A Long Term Love (And Less Of A Fling), to be sure what you’re creating is inviting, stimulating, and will keep your readers coming back for more.